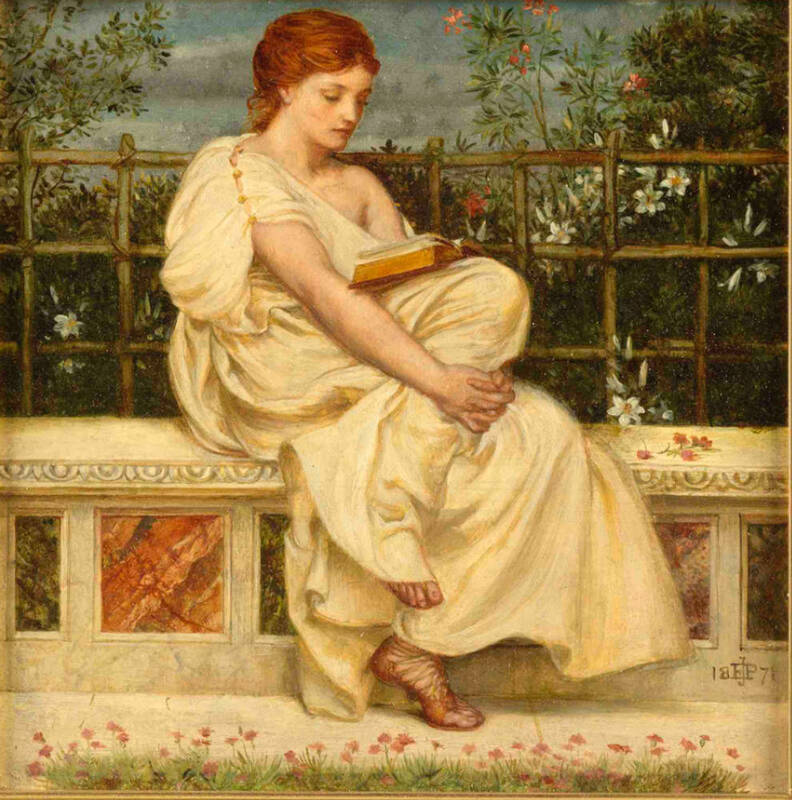 Reading by Sir Edward John Poynter Bt PRA RWS (1839-1919). 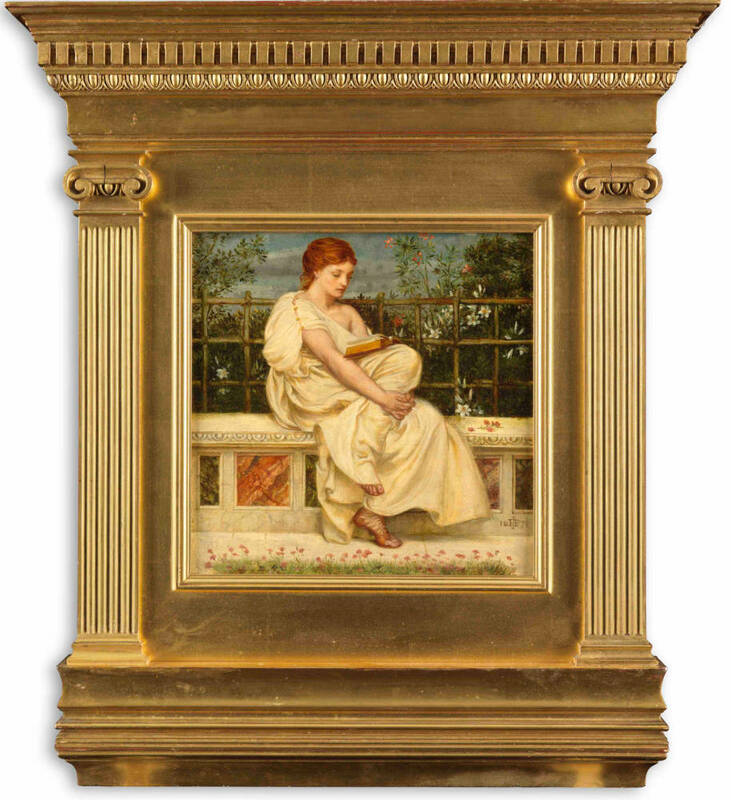 Oil over silver gilt on panel, 8 x 8 inches; monogrammed and dated 1871. Agnew's label with title, stock number 26334. Provenance: M de Murrieta; FD Lambert, Moor Hall, Sale of the Moor Hall Collection, Messrs. Foster of Pall Mall, in conjunction with Messrs. Daniel Smith, Oakley and Garrard, Bt. the Earl of Haddington. This painting, its pair (The Knot), and a third (called The Sandal, untraced), were painted between 1870 and 1872. The three panels, all the same size, were exhibited at the Dudley Gallery as a group entitled Three Summer Days, set into a drawing room cabinet of carved walnut and pear wood, the upper portion surmounted by statuettes, commissioned by Cristobal de Murrieta and designed by Edward Tarver for Messrs Gillow and Co. who made it. Tarver was the architect of Wadhurst Hall in Sussex, the new house of the de Murrieta brothers, wealthy Spaniards who had made a fortune out of trading with Argentina. They lost their money in the 1890s when Argentina defaulted on bond payments. Wadhurst Hall was sold, and the panels appeared, out of the cabinet, in a sale in 1916.